With a busy and hectic schedule on a regular basis, it is very easy for any ones home to become disorganized as you sit and stare, wondering where to start when trying to organize yourself again. With a few simple steps you can get yourself back on track and organized in no time, feeling good, and clutter free. 1.) Set a day- Set a day to focus on just decluttering and organizing. Don't make any other plans until you have finished and completed your task at hand. 2.) Set a goal- Example: Sunday I want to have my home office completely organized and clutter free. 3.) Start in sections- If you want to declutter your home focus on one room at a time, then focus on a section of the room. 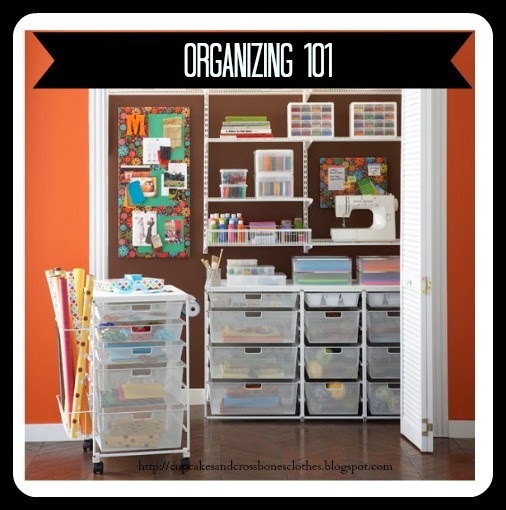 For example lets say you want to organize your home office. Ignore every other room in your home for the time being,then zone in on the closet. Bam! We have a starting point. At that starting point you want to take everything out. Sticking with our example, you will take every single item out of that closet. 4.) Make designated piles- Laundry baskets work perfect for this task. Grab two laundry baskets and one large garbage bag. Laundry basket number one will be where you put all the items that you want to donate/giveaway, laundry basket number two will be the keep pile, and your handy dandy garbage bag will be, well....garbage, thrown out, buh bye, sayonara! 5.) Ask yourself the big question- As you are sorting your piles ask yourself this, 'have I used this in the 8 months?' If not, do not keep it. This is how we accumulate clutter and junk and if you haven't used it in the past 8 months....surprise.....you're not going to use it, period. 6.) Make a list- After you are done sorting your piles remove everything but the keep pile from the room that you are working in. Sort your keep pile into organized categories. For example, You have a stack of blank holiday and birthday cards, extra office supplies (pens, white out, tape, glue), crafting supplies. Those are all little categories that you can divide your keep pile into. Once you have your final count of how many categories you have you want to write that down. After going through each section of your room and following the above steps you want to head over to your local Target, Walmart, or here for storage bins in the sizes that are appropriate for the items that you are organizing and purchase the amount you jotted down on your list. these are also great if you have items that are going to go out on open shelves. 7.) Label Time- Label the boxes that you are storing away so that you can clearly read them and grab them when you need it. 8.) On to the next- Once you are completely satisfied with the amount of work and organizing that you have accomplished in your one room, move on to the next. Some rooms may take longer than others and that's OK. As long as you focus on the task at hand (that one zone at a time that you are working on) you will be fine and your home, office, bedroom, attic, whatever, will be organized and clutter free in no time. I need to organize my office so I will be using this list. Good luck getting yours tackled! The list is a great place to start, let me know how it goes! These are all such great suggestions! I'm going to be doing a lot of organizing/de-cluttering in the next couple of months thanks to moving so I'm going to bookmark this! Hey Katie. Thanks girl! Congrats on the move, hope things are going smoothly. I hope these tips help you out in your organizing/de-cluttering process, I know it def works for me! I have slowly been working on my organization here at home. Geeeez its overwhelming but I've been using many of your tips and it has helped. I mean I can actually show my linen closet now without cringing LOL!